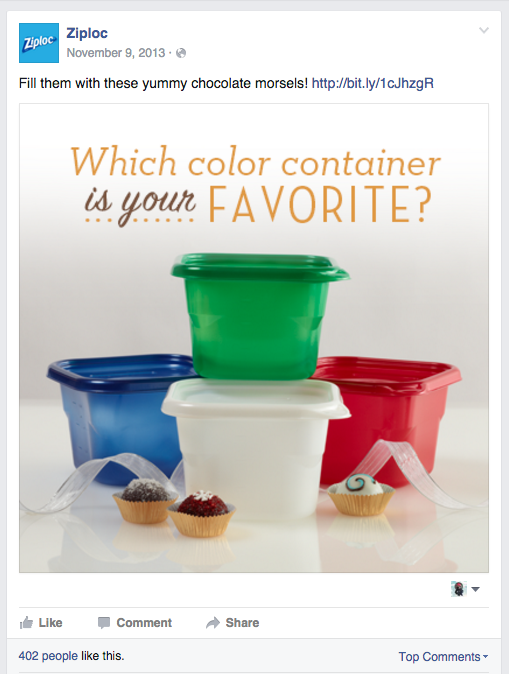 Ziploc was looking for a way to engage their targeted female customer and give more visibility to their Holiday Collection during the holiday season. Among other marketing platforms, they wanted to use Facebook more aggressively and double the amount of posts they typically publish. The content of these posts were to speak to their demographic in an engaging way provide helpful tips, during the holiday season and show her how she could also use and reuse Ziploc products in a way that would add value to the holiday season and save her time. Engagement would be the way the success of the posts would be measured. The challenge was that Facebook’s algorithm had just gone through some changes which had the potential to compromise the engagement of the campaign. Work with established style guide and assets for Ziploc Holiday to create messaging and visuals that evoke engagement. The copywriter and I both worked with the images we had to create posts based on that content we also came up with all new content for which I photographed and hand drew assets, including step by step recipe tutorial posts that we prepared photographed to provide visual aids. All in all it was an extensive amount of work with not much time to complete it all but we did the job. The client loved what we came up with and how the creative was executed, the content performed well in their tests and when published. The data gathered from that was used to inform the subsequent social media campaigns.